Selecting political leaders by popular election is an unquestioned hallmark of representative democracies—the institutional manifestation of Lincoln’s promise of a government of the people and by the people. But in 2016, Lincoln’s promise seems to have given way to Hamilton’s nightmare—with his worries that popular elections would produce demagogues who paid an "obsequious court to the people," appealing to their passions and prejudices rather than to their reason. This book examines the commitment to the widest level of participation among the largest number of citizens in the selection of the president. It looks at two salient characteristics of our current presidential election environment that bring the wisdom of this commitment into question: the declining influence of political parties and the communication revolution in the form of the internet, social media, and cable television. Ultimately, Mezey asks whether our now fully democratized presidential selection process has in fact diminished the quality of our presidential candidates and the campaigns they run, whether the turn to demagoguery that the founders feared has materialized, what the consequences of our presidential selection process have been for American government, and whether or not it would be valuable to rethink our wholehearted commitment to popular election of the president. His answers do not topple our commitment to popular elections but rather point the way toward improving the quality of both participation and democracy. Michael L. Mezey is Professor Emeritus of Political Science at DePaul University. He earned his B.A. from the The City College of New York, and his M.A. and Ph.D. from Syracuse University. He served on the faculties of the University of Virginia and the University of Hawaii before joining DePaul University in 1977 as chair of the Political Science Department. From 1993 through 2005, Dr. Mezey served as Dean of DePaul’s College of Liberal Arts and Sciences. He is the author of four books: Comparative Legislatures (Duke University Press, 1979), Congress, the President, and Public Policy (Westview Press, 1989), Representative Democracy: Legislators and their Constituents (Rowman and Littlefield, 2008), and Presidentialism: Power in Comparative Perspective (Lynne Rienner, 2013). 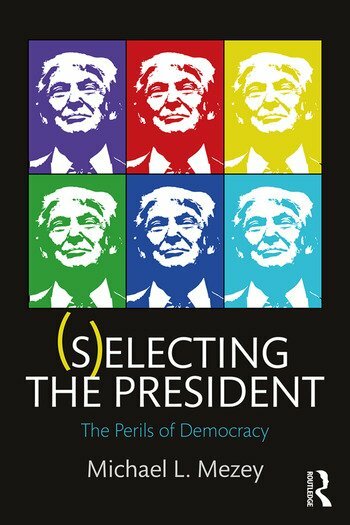 Michael L. Mezey’s (S)electing the President: The Perils of Democracy is a must-read for anyone interested in the current state of our presidential selection process. After the historic 2016 election, this outstanding analysis addresses the central dilemmas of American democracy today: As our electoral system becomes more democratized with increased demagoguery, is the quality of candidates and campaigns diminished? Is it possible to have good government and quality leaders? Michael Mezey’s new book, (S)electing the President, is an important contribution to the conversation surrounding popular elections. Drawing on the writing of ancient philosophers and our nation's founders, Mezey sends a strong message: that too much democratization of the nominating process and of the media might not be so beneficial as some think. His message is ignored at our peril. With clarity and insight, Michael Mezey provides students and faculty with an engaging and concise narrative and analysis of the process by which we select the president of the United States. (S)electing the President is a must-read for students taking courses in introductory American government, elections, political parties, and politics and the media who want (and need) to better understand the history of the selection process, and specifically the 2016 presidential election. There is a conundrum at the heart of American electoral politics: The more democratized the presidential elections become, the less likely the most qualified candidate is elected. (S)electing the President casts a critical eye at the tension between democratic appeal and governing competence – pinpointing causes, consequences, and potential reform – and pierces this conundrum. Michael Mezey’s broad historical sweep and careful contemporary analysis should be a wake-up call for anyone concerned about the dynamics and outcomes of recent presidential elections.